§A Ragnhildr placed this stone in memory of Alli the Pale, priest of the sanctuary, honourable þegn of the retinue. §A Ragnhildr placed this stone in memory of Alli, priest of the Sølve, honourable þegn of the sanctuary-retinue. §B Alli's sons made this monument in memory of their father, and his wife in memory of her husband. And Sóti carved these runes in memory of his lord. Þórr hallow these runes. §C A warlock be he who damages(?) this stone or drags it (to stand) in memory of another. 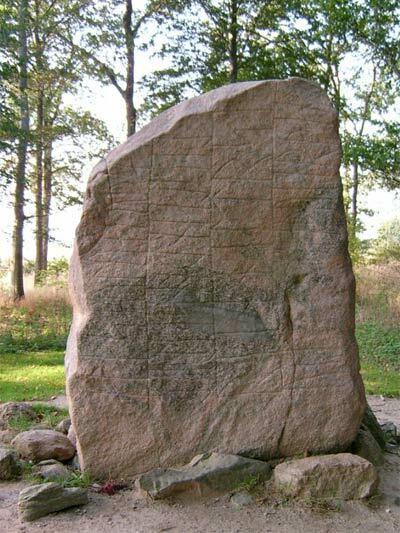 With its 210 runes, this stone has the longest text of all the rune stones in Denmark. 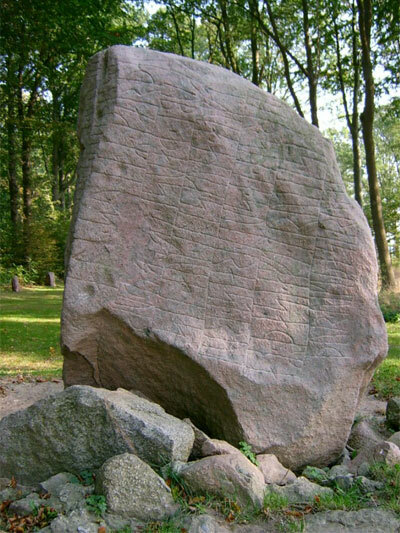 It is the stem stone of a stone ship, like the Tryggevælde stone once was. It also contains the same "warlock-threat".... You'll find it on the island of Funen ( Fyn ) in Denmark. Finally I'd like to thank Felix for these photos.